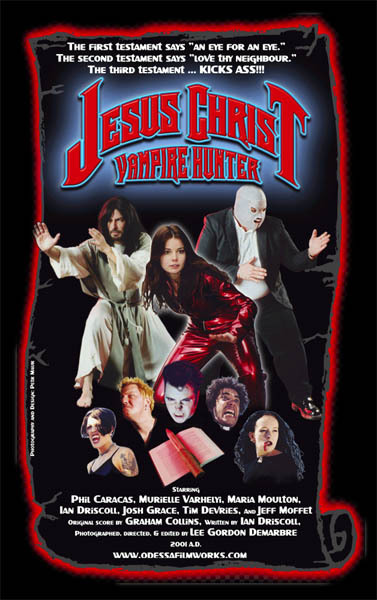 *But not that vampire hunter version. That wouldn’t be fair for that poor rabbit. The other day the crew (Young Extroverted One, Elder Extroverted Holy One and I) went to the 12th South Taproom to attend the CD release party of Leslie McClure. We got there a little too early but we sort of planned to eat before the show. After finishing our meal the YEO started to get restless and began singing Easter songs which mostly consisted of bunnies and stuff. While we aren’t freaky and fundamental about it we do try to be intentional about the Christian holidays. So, EEHO brought up that we also, and mostly, celebrate the resurrection of Jesus at this time of year. “So, why don’t we sing songs about Jesus instead of Easter?”** thus spake the YEO. Because in her mind Easter is the candy and bunnies and chicks and that annoying fake grass you put in baskets. It’s kind of difficult to keep a balance between the secular, commercial side of holidays and the other religious side. For Pete’s sake (ya like that don’t ya? ), the YEO is a potential preacher’s kid. She shouldn’t go through life just celebrating the Roman-pagan holidays. I think she needs to see both sides of the festivities (while not demanding the double-up of goodies). Not only do we like to be religiously appropriate but also historically appropriate. It’ll make for a nice clash of ideals for teachers/authoritarian figures to deal with later. Maybe we’ll send her to a private Christian academy of some sort in Kansas. **UPDATE: Apparently, my recollections of the YEO’s quote were clouded by the many Highland Brewing Company’s Gaelic Ales that I consumed. I suppose the EEHO should be my editor before I publish my posts. But that would take way too long. The Young Extroverted One actually said, “Why would we sing songs about Jesus at Easter?” I apologize for my misquoting of the YEO lest she sue me for libel. Anyone in the Nashville area that is without a place to worship or want a change of scenery should come to Trinity Presbyterian Church tomorrow. This is where the Elder Extroverted Holy One will preach at 11:00AM. I’ll be there even though by then I will have heard it for the fourth or fifth time. I guess it makes up for all of the unchurchiness I have done in the past. My lovely bride is so awesome up there preachin’ to the masses! 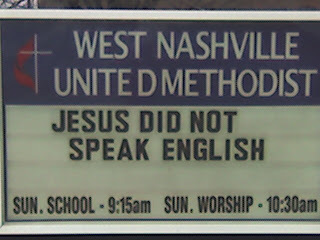 I found this by way of Nashville is Talking. Thinktrain: What would Jesus speak?